I picked up an odd little Agfa camera, the Isoflash Rapid, a while ago. It uses two canisters that hold 35 mm film, but that lack winding spools. 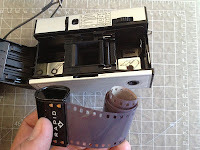 The advancing teeth pull film out of one cartridge and sort of "shove" it into the receiving side. There's a fantastic write-up at lomography that goes into all the details of Agfa's Rapid brand. I only have the "take up" canister, and a 35mm canister is slightly too tall to just remove the spool part and drop in. What I did was get the camera and a roll of Ilford XP2 Super into a changing bag and improvise. I pulled out some XP2 and cut it off. I stuck a half-inch or so into the take-up canister. Then I just rolled up the rest of the film and put it, un-canistered, on the other side. I shut the camera, and hoped it would feed the loose film into the canister properly. Mechanically, it ended up working just fine. After I'd shot the roll, I threw the camera into my changing bag and rolled the film into an empty 35mm canister for its trip to the lab. Naturally, the camera wasn't built for 400 speed film, so the film got totally cooked. 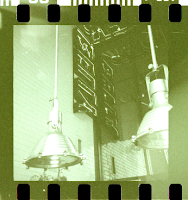 But the camera does function, and my film kludge did work. The results are in a Flickr set. Hi Gabriel, it's Iván From México, i'm in love with film. I'm searching a camera like this, I love agfa, but I have some doubts about this kind of cameras, they use batteries or are entirely mechanical?, you burned that ilford, you recommed me a slower film to use? The agfa wanted a battery, but only for the flash, so I didn't bother trying to find one. As for the film, I think I'll try Ilford Delta 100 next.